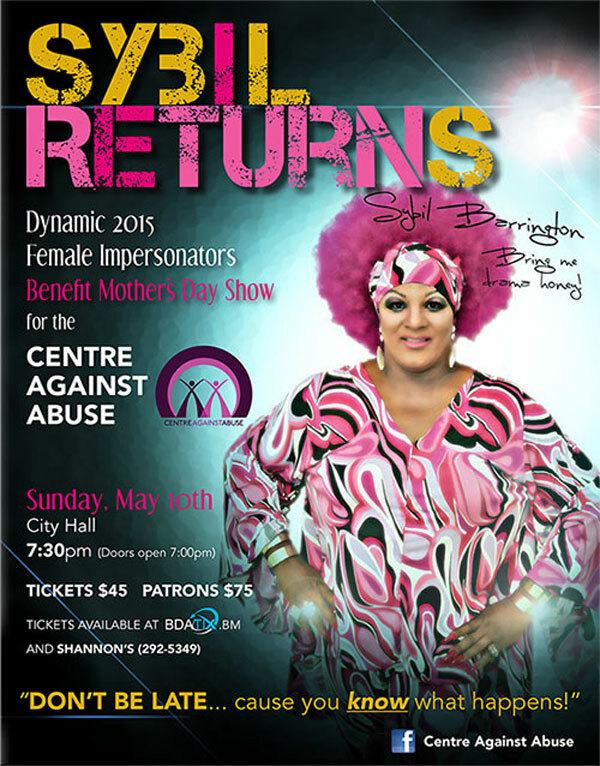 Bermuda’s preeminent female impersonator, Mark “Sybil Barrington” Anderson, will be the feature entertainer at Sybil Returns, a show featuring “dynamic 2015 female impersonators” with a Mother’s Day theme, with proceeds to benefit the Centre Against Abuse [CAA]. The show will take place on Sunday, May 10 at City Hall; doors will open at 7.00pm, while the show will get underway at 7.30pm. Tickets are available at bdatix.bm, or at Shannon’s by calling 292-5349, and cost $45, or $75 for patrons. When asked why he chose to support the Centre Against Abuse, Mr. Anderson said, “It all started back in August when CAA was looking for assistance pertaining to the shelter closing down. I realized that, after a period of time and not seeing anyone coming forward, I felt the need to do something, and I did a charity walk for them in September. “After the walk, I stated that I would love to do a show next time for CAA, and here we are. I grew up with violence in the home. I grew up with my stepfather beating my mother. At that age in my life, I could not understand how a man could beat a woman that he was supposed to have loved. I still don’t understand it. When asked what those in attendance should expect from the show, he said, “High class drama! The audience can expect a lot of love, laughter, and professional entertainment with stylish costumes and gowns. When asked if Sybil Barrington would be performing at any other upcoming local events, Mr. Anderson said, “Sybil can promise you that she does have something under her heel that she is planning for September for Centre Against Abuse, so stay tuned. This man is an absolute hero! Look forward to the show and helping a worthy cause. All the very best in raising funds for a silent, but widely known sad cause. Abuse is abuse, and it must be exposed and stopped. I trust that Bermuda supports this worthy cause. Even though I disagree with HIS gender situation, he does good deeds, a hero, I guess all depends who you ask. Some would say Henry Cox was a hero and some would disagree, some would say Louis Brown-Evans was a hero and some would disagree. One attribute for a hero is MORAL EXCELLENCE, and I guess that too can be debated at length, but HE does good deeds.